Since it is human nature to complain, it is but natural to complain about the scorching heat during the Summer and the crazy rains during the Monsoons – and also wail that there is no fish as fishing boats stay put (most times). Most of us fish lovers end up eating the same type of fish week after week or just seek more carnivorous options such as white & red meat besides eggs. Since we don’t bring a lot of red meat regularly and Chicken becomes a bore if eaten more than twice a week, I decided to play around with some recipes for the fish sitting in my freezer. 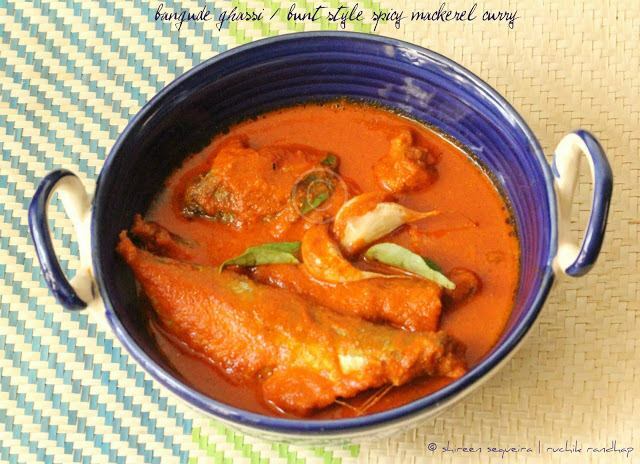 I didn’t have to hunt too much, for I had already tried Charishma’s recipes before, so I blindly followed her instructions to make this gorgeous Mackerel curry – a famous Bunt version called the Bangude Ghassi – oh so spicy and perfect for a rainy day when everything outside looks bleak and depressing. This curry brought a lot of flavour and colour into my day and we thoroughly enjoyed it. The blend of spices gives it the required punch (if you are not used to spicy food – the spice just ‘hits’ you!) and the fragrance is simply ‘wow’. For those of you who wish to know the difference between the way Bunts make their curries and the way we Catholics make it is that they make use of Fenugreek (Methi) & Carrom (Ajwain) in a majority of fish and meat dishes which makes it distinctly flavourful and fragrant. 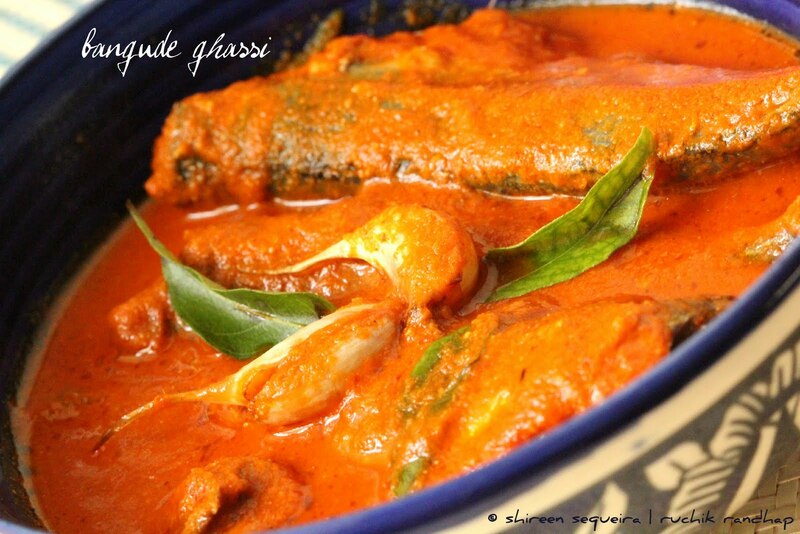 Mangalorean Catholic cuisine has a lot of Portuguese/Goan influences which makes our food comparitively a bit on the sweetish/blandish side with spice levels that are drastically toned down. So a majority of folks I know from the heart of Mangalore will grab a glass of water and sip it down in between an extra spicy meal. So in short, Bunt cuisine is to me what Andhra cuisine is like to the rest of India – Spicy, fragrant, flavourful, finger lickin’ good and makes you ask for MORE! 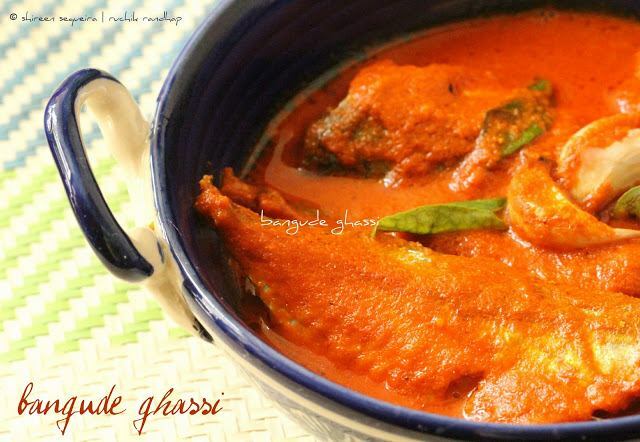 That reminds me that I ought to try some Andhra recipes soon, but for now its Bangude Ghassi for you! 1. Descale and thoroughly clean the Mackerels and allow to drain in a colander. 2. Dry roast all the ingredients (except the ginger and tamarind) mentioned in ‘For the masala’ one by one. Remove and let cool. Then grind them along with the ginger and tamarind to a paste (needn’t be fine) using a little water. Yes I am exposed to cooking with coconut milk. I come from the Philippines and we have dishes cooked with coconut milk. My family loves Indian food too. Our bestest friends in Florida are from Banglore and we enjoyed having dinner at their place as much as they did with us too. Very spicy and lavish looking fish curry. Wonderfully prepared. The color is enticing ~ a great blend of ingredients n the outcome is truly awesome! Thanks Ashu!!! So glad to hear that you liked the ghassi!! Enjoy!! Hi, I tried your recipes. Its just wonderful. My hubby manglorian and I'm maharashtrian and there is no one who can teach me the manglorian dishes. My hubby always miss his mother recipes. I thankful to you for everything. I'm really happy because of you share special traditional mangloreian recipes. Thanksssssssssssssssssssssss Loooooooooooooooooooooot . Hi.. I was cooking bangada for the first time and was very anxious , how it will turn out, but i followed your recipe and it turned out excellent! Thankyou so much. Even my husband appreciated. He is very particular about taste and I am happy that I could please him! Please do post more mangalorean dishes so that I can keep making tasty food. Keep it up! Thanks a ton! Hello Shireen, can we use sardines instead of mackerel in the above dish? Hey hi…I have a doubt. You have mentioned tamarind in the ingredients but have not mentioned when to put it in the gravy. I am planning to make this curry today and I thought I'll clear my doubt before starting. @ Naina: The tamarind is to be ground along with the roasted spices. I have updated the recipe now 🙂 Please check! Is there a way to give an option to select the number of servings and basis that the quantity for each would change.. If you look at other recipes you do come across this feature. Yes, there is an option like that which gives the servings and nutritional value too but it is a paid version of the same template that I use. which I haven’t opted for yet.